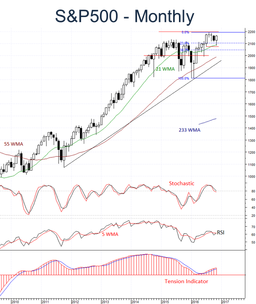 US Equities are attempting to regain higher levels, with prices bouncing back into consolidation beneath critical resistance at the 2193.81 high of August. A break cannot be ruled out, as the Tension Indicator continues to strengthen, but falling momentum studies and bearish background readings are expected to limit scope, with investors to adopt a sell-into-strength strategy. In the coming months, downside risks should increase, with a break below the 2074~ low of July targeting the 2050 retracement. A close below congestion around 2000 would add fresh selling pressure, as trendline support from 2011 then attracts. To access the full report, covering the US, UK, Germany, Europe, Emerging, Hong Kong and China indexes, please click here.